Late this summer, a friend (who happens to also be a photographer) and I got together to photograph our sons in a vintage inspired lifestyle photo session. We chose a beautiful location local to Edmonton - Lake Chickakoo. My friend, Jenny, and I went shopping weeks in advance to try to find special clothing for our boys (first stop, WEM!). We shared text messages back and forth with our prop finds. I’ll have to give credit to Jenny for most of the work though! She knew exactly where to look! Eventually, the day came and met up at lake and headed down the trail to our spot. If you’ve been to this area, you know it can be busy with hikers, runners, dog lovers, and even horseback riders! It wasn’t too busy this day, but the boys were happy to entertain those passing by. 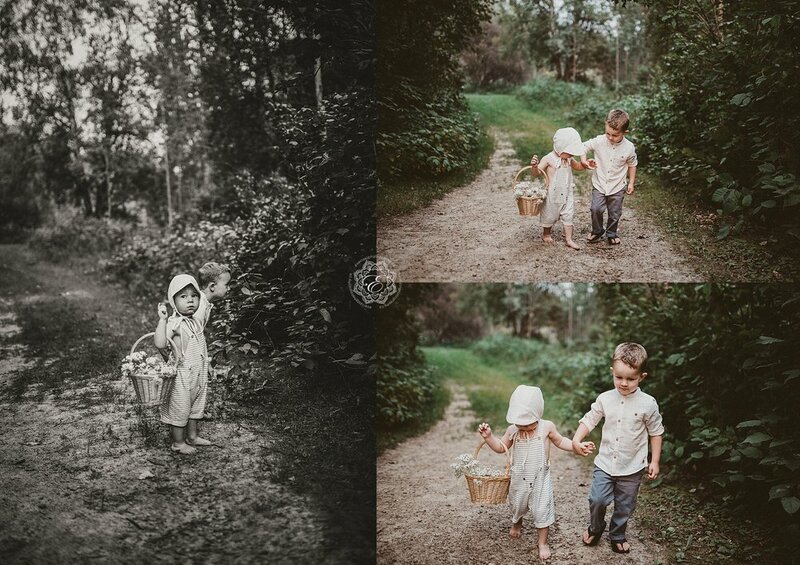 We sure had our hands full photographing these two toddlers! We each had double duty with photographing as well as mothering! I’m sure you can imagine us running back and forth and trying to grab their attention, if even just for a moment. Luckily, we also had an extra helping hand from Jenny’s husband, Tom. Thank you Tom! The boys were so sweet though! They were so happy to play with one another, help each other, share and explore together. It was heartwarming to be able to capture these moments, as a photographer, but more-so as a mother. I know my little boy is growing up fast these days, and it makes me so happy to have captured some of his curiosity, love for play and outdoors, and his kind and loving heart. I know, not long from now, I’ll look back on these photos with so much love and warmth, remembering when he was three years old. These will surely be some of my lifetime favourite photographs! If you’d like to see Jenny’s beautiful work, please visit here.